Billy Wilder’s Double Indemnity is one of the earliest and best examples of film-noir. It helped develop the style on screen which fits so well the stories and dialogue of hard-boiled writers such as James M. Cain and Raymond Chandler. Cain wrote this one, in the 1930s, and it was published two years after his even more famous debut, The Postman Always Rings Twice. The film stars Barbara Stanwyck, Fred MacMurray and Edward G. Robinson. All actors are in top form. The film is interesting not only in the way that the crime is carried out but also in trying to understand the motives of the perpetrators. Nothing is clear cut, and that’s how Wilder likes giving it to his audiences. Wilder’s directorial credits include Sunset Boulevard, The Seven Year Itch, Witness for the Prosecution, Some Like It Hot and The Apartment. He directed fourteen different actors in Oscar-nominated performances. One of them was Barbara Stanwyck in this film. 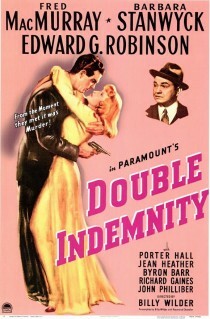 Double Indemnity was only Wilder’s third film as a director. But it does not show. Not at all. This is a great one, only saw it for the first time a few months ago, but it still feels quite modern despite the black & white etc. The score’s cool as well and stayed in my head for a few days after, maybe because I let the DVD menu roll for a few times while I made some food. Never the less, there aren’t that many movies made around that time with catchy music I’ve found.